Although the instruction manuals which are supplied with complete recording systems generally cover in considerable detail the exact procedure for making various types of recordings, there are a number of points in this procedure which I particularly want to stress. It is always better to record in a room which has been arranged specifically for this purpose. This means that the walls have been soundproofed by covering with an absorbent material such as Celotex, and drapes are available if necessary to prevent undesirable reflections of sound. With a portable system, however, recording technique will be much the same in the studio as at an outside location or in the home of a customer. Continuous monitoring of the sound level at the cutter is essential to prevent this level from getting so high that the cutter needle breaks into adjacent grooves. A single exceptionally loud sound or crescendo of music can, if not offset by a reduction in the gain of the amplifier, result in cut-over and thus ruin a recording. The reproducer needle will swing through the cut-over section into the next groove and either skip an entire revolution of the recording or follow the same groove over and over again. A rehearsal of the program to be recorded is recommended wherever possible. No disc is cut during the rehearsal, but the operator watches the level-indicating meter and notes where peak occur which may require a reduction in gain. When recording outdoors in locations where sudden loud noises may be expected, the recording will have to be done at a low enough level to prevent over-modulation or cut-over. This will of course bring up the noise level when the recording is played back at normal volume. Keeping the microphone as close as possible to the source of the sound being recorded and securing the cooperation of those in the vicinity to prevent unexpected loud sounds which might be picked up by the microphone, will result in a better recording. Practically all complete recorder systems have provisions for plugging in headphones for monitoring purposes. The sound level meter itself simply indicates level without showing whether it is noise or a desired program; the headphones tell how much noise there actually is. When the play-back loudspeaker and amplifier are mounted in a separate carrying case from the recorder, provisions are generally incorporated for plugging the loudspeaker into the amplifier for monitoring purposes; in this case the loudspeaker is in parallel with the cutting head. A loudspeaker can be used for monitoring only when the microphone is in a different room; otherwise there would be acoustic feed-back and howling just as in a public address system. The same principles apply to the arranging of performers around a recording microphone as for public address systems and broadcast studios. A rehearsal for monitoring purposes is the best possible check upon the arrangement of performers and should be made whenever possible. Too much cannot be said concerning the importance of leveling the recording turntable. It is obvious that any tilt in the turntable will cause the cutter to swing more heavily to one side of a groove than the other, impairing the fidelity of the recording and lowering the maximum permissible amplitude without cut-over. A small spirit level is provided with some recording systems for this purpose; it is placed upon the turntable before a recording is made and the carrying case is blocked up with pieces of wood or cardboard (if adjustable feet are not provided) until the turntable is absolutely level in two directions at right angles to each other. If a spirit level is not provided with your system, you can purchase one in any hardware store. Adjusting Cutter Needle To Correct Angle For The Type Of Disc Used. When starting to record, the cutter head should be lowered gently onto the disc while the turntable is running to keep shocks at a minimum. 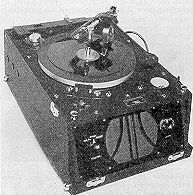 Just before you are ready to record, place a test record on the turntable and cut a few grooves without speaking into the microphone; a hissing or squealing sound heard when these grooves are played back indicates either that the needle is dull or is set at the wrong angle, and corrections are necessary before the recording can be made. When cutting a cellulose-coated disc, allow the thread to wind up around the center spindle when cutting from the outside in. Never let it become tangled around the cutting needle. The lighter the pressure of the cutting needle on the record, the longer will be the life of the record; the most satisfactory pick-ups are those which require a pressure of only about 1.5 to 2 ounces. With cellulose-covered discs, be sure to apply the preservative solution immediately after recording if long record life is desired. With aluminum discs there is no thread cut out from the surface; the needle simply presses the groove into the aluminum. No preservative solutions are required for aluminum discs. With modern electric phonographs, high-quality steel playing needles give best results on cellulose-coated discs, but fiber-or thorn needles can also be used. With the old-fashioned acoustical phonographs, where the reproducer and needle are at the end of a tone arm which is a part of the horn, steel needles which are bent at an angle should be used to offset the weight of the heavy pick-up unit and reduce record wear. These bent needles can be obtained from almost any modern manufacturer of recording equipment. Straight nonmetallic needles should be used for play-back of aluminum records on all phonographs. The fact that a recording system gives satisfactory results when first used is no guarantee that it will continue to perform properly. Each and every part of the system must work perfectly at all times and therefore the apparatus should be checked at regular intervals for deterioration or possible signs of trouble. Furthermore, a recording system is a delicate piece of scientific apparatus and must be treated as such; rough handling, particularly of the cutter head and pick-up, can ruin the fidelity of the system and necessitate extensive repairs. When doing commercial recording, it is usually necessary to play back the disc immediately for the customer. The quality of your work will be judged by the sound of this first play-back, and therefore every piece of apparatus used in the play-back must be capable of as high fidelity as that originally used in recording. Furthermore, the play-back should be in a room having favorable acoustics. In recording radio programs it is, of course, possible to place the recording microphone near the loudspeaker of a radio receiver, but this is not conventional practice. Far better results are obtained by removing the microphone entirely and making connections across the voice coil of the receiver loudspeaker for direct feed into the microphone input terminals of the recording amplifier. The voltage across the voice coil is usually of such a value that a proper recording level can be obtained by adjusting the receiver and amplifier gain controls. Since no microphone is used, the receiver loudspeaker can be used for monitoring purposes and therefore need not be disconnected. With this setup the fidelity of the radio receiver will affect the fidelity of the recording.